Craig Davies's 77th-minute goal for Bolton denied Billy Davies a winning return as Nottingham Forest manager. Andy Reid's strike from the edge of the area just before the hour had given Forest the lead. But Craig Davies found the bottom corner to level the game and earn his side a valuable point as they moved four points above the drop zone. Marcos Alonso was sent off late on for a foul on Reid as Forest sit 11th, eight points off the top six. 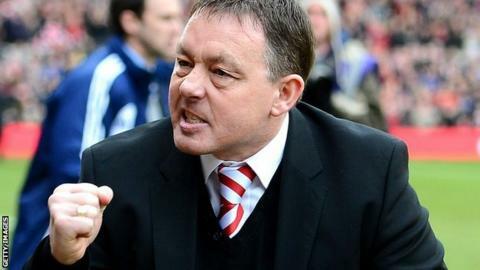 Billy Davies, who was sacked by Forest in June 2011, was officially taking charge for the first time since he agreed to return to the club and said he had "unfinished business" at the City Ground. Forest had won one in eight before the fixture but started brightly and Bolton keeper Adam Bogdan was forced into a series of fine first-half stops. The Hungarian's best save came when he repelled a Simon Cox effort which was arrowing into the top corner. But he could do nothing on 59 minutes as a Henri Lansbury flick found Reid, who timed his first-time volley perfectly to give the hosts the advantage. Bolton boss Dougie Freedman responded by making changes and two of his substitutes, David Ngog and Craig Davies, combined to produce the equaliser with 15 minutes remaining. Jay Spearing won possession in the middle of midfield and unleashed Ngog, who raced into the box before cutting back for Craig Davies. The former Barnsley striker swept the ball home to grab a point for the Trotters and tarnish Billy Davies's return. Nottingham Forest manager Billy Davies: "For a new manager to step in and get that kind of reaction is superb. The team were great, the fans were great but we just could not get the result that would have topped it off. "Shots were raining in on their goal and I said to the players at the end if you give me that effort, application, full-backs getting forward and chances created I can't complain. "There's a lot of work to do but the fans must be pleased with the response from the players - I'm delighted by it. Bolton are a good side, who should probably be top two, but I'm sure they would accept they got away with murder today." Bolton manager Dougie Freedman: "We had a game plan to be cautious at the start and build momentum in the second half but the sending off was difficult to take. We had to dig in deep but I thought we did that and deserved the point we got on a day that was always going to be a hard one. "Our goalkeeper [Adam Bogdan] did well for us. It wasn't just his saves - that's what he's there for - but his organisation and willingness to come and take responsibility was important for us. "We knew what to expect with a new manager coming in to Forest this week. Billy knows what he is doing and although expectations are high, there are a lot of clubs capable of getting into the play-offs and Forest are one of them."